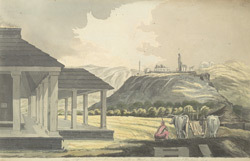 Water-colour drawing by John Jhonson of the monolithic statute of the Jain Tirthankara Gomateshvara at Karkala in Karnataka. This drawing is taken from a sketch-book of 36 drawings (36 folios) depicting scenes chiefly in W. India and Mysore, dated c.1795-1801. A few inscriptions in pencil and ink remain (some relating to Colonel Johnson); others have been trimmed.